It is easy to overlook the importance of those fledgling Greek farmers, but they were a unique phenomenon for mankind. In the developed civilizations outside of Greece, agriculture was centralized and highly bureaucratic, with Kings considered semi-divine, wielding power in societies where concepts of individual liberty meant very little. By contrast, the Greek civilization that would emerge with the rise of the independent farmer fostered an idea of an active political and communal life, had a limited bureaucracy and lacked the separate castes of priests and full time bureaucrats that were present in other Mediterranean and Near East civilizations. It was a society in which secular, speculative natural philosophy rooted in reason could emerge and flourish. In short, Western civilization emerged on a foundation of free, independent farmers who privately owned and worked their own land. Confidence in the permanence of the ownership of their own land led farmers to invest in their improvement, and cultivated a recognizable set of characteristic values: strong family units, self reliance, skepticism of government interference, distrust of taxation and a respect for property rights and individual freedom. Independent and outspoken, the family farmer embodied virtues that underpinned democracy. These traces run throughout Western history. The significance of the independent farmer was reflected in the political and military importance of the Hoplite class in ancient Greece. These farmer-citizen-soldiers personified the polis, the wider community. Even as the Greek City States fell into decline the farmer-citizen-soldier ideal remained present in Western thought. The early expansion of Republican Rome rested on its fighting men, and these were independent farmers able to afford the necessary equipment. 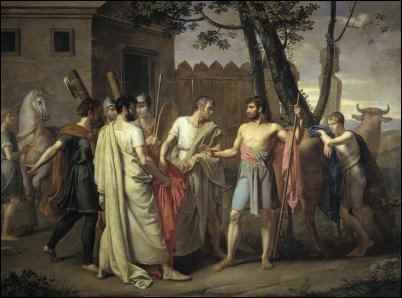 It was men like Cincinnatus who came to be looked upon as the Roman ideal. An aristocrat who worked his own land, he was twice nominated dictator when Rome was in peril, and twice he held power for no longer that absolutely necessary, returning to his farm when his job was done. As the Republic became a victim of its own success and large scale slave plantations emerged in the Italian countryside, writers such as Cato, Cicero and Virgil would praise the virtue of the independent farmer, lament his demise and argue that the moral fiber of Rome was also declining hand in hand. Decades later, many would compare George Washington to Cincinnatus. Revolutionary officers, well schooled in the classics, established the Society of the Cincinnati to promote and preserve the ideals and beliefs of the American Revolution. The leading founding fathers were all landholders, and America was not unique in this regard. Farming communities are natural opponents of oppressive and alien regimes. The British discovered this in the Revolutionary War, as did the French Republic in the Vendee, Napoleon in Spain and the British Empire again against the Boers. While George Washington may have represented the ideal, it was Thomas Jefferson who was the most prominent agrarian of the Founding Fathers. In a letter written in 1785 Jefferson stated that “Cultivators of the earth are the most valuable citizens. They are the most vigorous, the most independent, the most virtuous, and they are tied to their country and wedded to its liberty and interests by the most lasting bonds”. For Jefferson, the only sound base for a free democratic Republic was a society comprised of independent landholding farmers. He would write to George Washington in 1787, expressing his belief that “Agriculture is our wisest pursuit, because it will in the end contribute most to real wealth, good morals, and happiness.” Jefferson believed, as did his classical predecessors, that farming was not simply an economic mode of life, a means to an end. It was something more, and the farmer impacted the culture, society and morals of the wider nation. The farmer looked not to others to live, but to the earth and to heaven. He was not dependent on patronage, and had no need to cater to others, and it was these individuals that Jefferson believed would be the bedrock of the new American Republic and the best defenders of liberty. This was not just romantic idealism on the part of Jefferson. The young American nation would see three armed anti-tax revolts from farmers in less than eighteen years. 1786 saw Shay’s Rebellion in Massachusetts, 1791 the Whiskey Rebellion in Pennsylvania, and in 1799 Fries’s Rebellion—once again in Pennsylvania. If vigilance was the price of liberty, it was the independent farmer who seemed most willing to bear the cost. Given the idealization of the yeoman farmer as a bastion of independence and individuality, it is then no surprise that Marxism would see the farmer and his rural community as a threat. Farmers, conservative in nature, untrusting of interfering government and largely self reliant, were incompatible with the ideals espoused by Marx, who dismissed the “idiocy of rural life”, as well as the abolition of private property fundamental to farming—two of the ten planks outlined in the Communist Manifesto are clearly focused at undermining the rural ideals of individuality and independence. “Extension of factories and instruments of production owned by the state, the bringing into cultivation of waste lands, and the improvement of the soil generally in accordance with a common plan” and “Combination of agriculture with manufacturing industries, gradual abolition of the distinction between town and country, by a more equitable distribution of population over the country” can only been seen as an implicit recognition by the opponents of private property and personal freedom as to how important a farming community is to fostering and preserving such beliefs. Within this wider historic context, one can only look at the current state of American farming with a great unease. The family farm has long been on the decline. Sixty years ago there were over six million farms in America, now less than two million remain. Three percent of farms earning more than $500,000 in sales account for 44% of US agricultural production. The average farmer earned only $8,000 in 1996. In contrast the packaged food company ConAgra can boast revenues of over ten billion dollars. Farming is becoming anonymous, industrial and harmful. The family farm is being strangled not by economic turmoil, environmental catastrophe or disease, but by pen and ink—government rules and regulations have a disproportionately negative impact on small-scale farms. These small operations do not have the flexibility and size to absorb the needless regulations and the changing whims and demands of bureaucrats, while the current structure of subsidies also favors quantity over quality. The latest attack on the family farm to come from the Federal Government, involving restrictive child labor laws, was, we are thankful to say, abandoned, but it is representative of the draconian and detached manner in which small farmers have been treated by successive governments. In addition to this domestic threat of a meddling and stifling government, globalization is also hastening the decline of the American farm. The costs of “free” trade are being felt on our farms as they are in our factories, but farmers are in a more difficult position than factory owners, mobile laborers or skilled workers. Farmers are connected to a fixed landscape with knowledge invested in the characteristics of their locality. To apply the cold and simplistic arguments of free trade and globalization to farming is naive in the extreme. Those who would do so would do well to bear in mind the wisdom of Adam Smith, who in his “Wealth of Nations” declared farming the most natural occupation for man and thought of farming as the most productive of economic enterprises, and crucial to the well being of all. In a modern world that favors mobility and those who have no attachment to place, small family farmers can only stand to lose. Farmers and the practice of farming must receive special consideration. This is not just a practice that produces jobs and goods to be consumed, but a way of life that sustains unique traditions, cultures and human links to the landscape. The increased diversity of land use, stewardship of the environment, community empowerment and local economic benefits all act to boost the wider well being of our nation. Some might argue that the decline of the family farm and the communities they support parallel the decline of the nation as a whole. 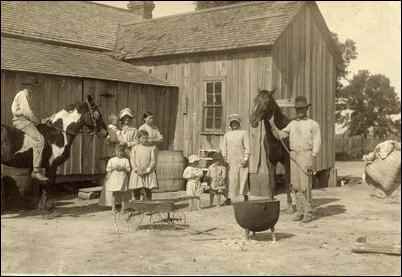 For most of its history America was predominantly rural in character, with farmers being the most active of political citizens. Neither serving nor ruling, it was the independent farmer that came nearest to realizing the American dream. You don’t have to subscribe to Marxism to agree that the dominant economic mode of life has a large impact on the character of a society. Nor do you have to be a romanticist to feel unease about the health of a society that rests on ever centralizing, commercializing and impersonal urban centers. 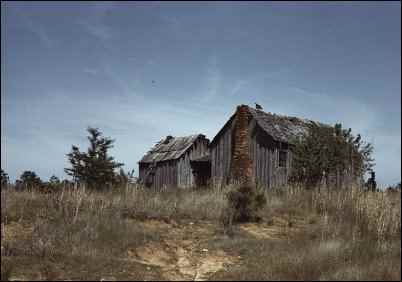 The rural landscape acts as a mirror of the wider civilization, and the reflection cast in America is an unhealthy one.